I know it’s not everyone’s schtick. But I grew up in a household and region in which the majority of folks identified as some Christian denomination that deemed it acceptable to celebrate Christmas in December (there are at least a couple that don’t). Over the years, the holiday has lost the religious overtones. It’s essentially a time for the family to gather, although I’m the only one who lives far away from all the others. But the houses are decked with trees, lights, stockings, tiny villages, snowpeople, and sundry other seasonal decor. There’s baking and candy making and a few hours of cooking for a special dinner with the family around the table. The kids are the major focus for the gifts, but the adults exchange a few tokens of affection too. Christmas 2013 was a very different holiday. My dad has a new partner. They started dating just about a year ago. She moved in this summer. They’re engaged but no date has been set. I am now divorced. This was the first visit with family since the process was common knowledge. Although I traveled alone for the holiday with the family this year, I’ve been dating this incredible guy for some months now. Charming and thoughtful, he brings warmth and joy into my life. I can be myself and discover myself. In recent weeks and months, I’ve found myself reflecting. On my past, present, and future. On events I thought I’d processed. On things others left behind. Against this backdrop, the story unfolds. The ribbon and paper fall away. I’ve mentioned it before, but when I was kid, my older brother wrote what was essentially Star Trek fan fiction in screenplay format. They were typed on our first family computer, a DOS machine from the pre-Windows era. The word processor was Lotus Works. The pages were printed by a dot matrix printer. My brother, dad, and I would do readthroughs, each of us picking up a few of the characters and using different voices for each. Many hours were expended in this way – and gladly, even then. When my dad’s partner moved in this summer, rooms and closets were rearranged. As they cleaned out a closet, his partner found a stack of my brother’s screenplays. She thought something should be done with them, so for part of my brother’s Christmas present, they organized and bound the original scripts and revisions. There was also a notebook of notes such as his ship’s crew roster and sketches of its interior and exterior design. Needless to say, my brother was surprised and pleased by the gift. Soon after my brother opened his gift, I was a handed a present to open. I unwrapped and opened the box. 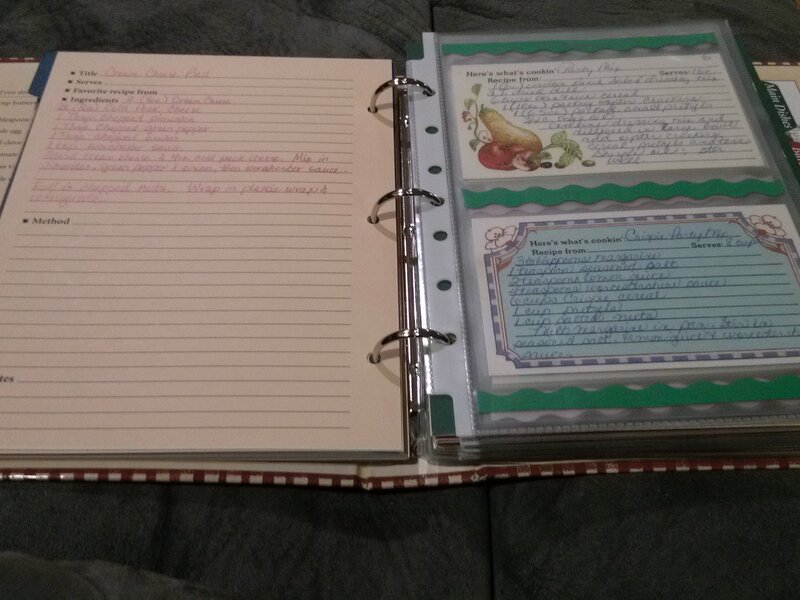 Inside, I found of those binders for collecting and writing recipes. Something about it teased some distant neurons in my brain. It felt familiar. Even before my dad told me to look inside, I had a suspicion that the pages weren’t blank. I opened to a random section. My breath caught. My eyes teared. I barely stopped short of crying as I saw the elegant script on the pages and cards. It was my mother’s handwriting. 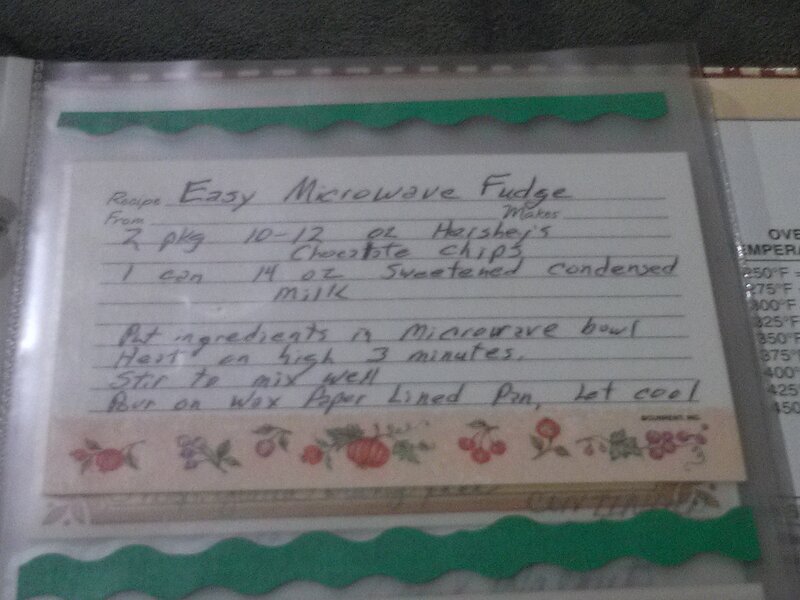 The binder was filled with recipes that she had saved and transferred over the years. Later, as I took a closer look at the dishes included, I realized how much more it was than ink on paper, even beyond the treasure of it being my mom’s. Dinners with family, big potluck meals with friends, canning food, edible homemade goodies at holidays – all were a part of our family. The kitchen, often with the dining room table right in the middle of it, was a central feature of many a family event and tradition. 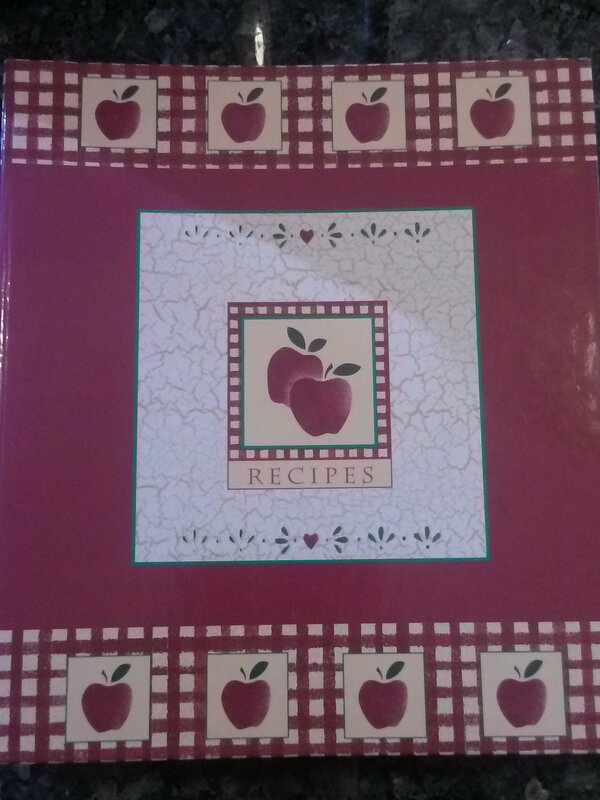 And some of the recipes in this book hold wonderful memories of them. Like the one that is my grandmother’s recipe for pickled beets – which kind of unnerved me as a kid. These big squished spheres in this deep purple juice didn’t seem natural. I was an adult before I realized it was the beets that colored the pickling juice, not the other way around. I finally tried them several years ago and found them to be delicious. Or there’s the recipe for sweet potato souffle from a dinner theater in Ohio. A dear family friend who’d been the music instructor at a local community college (my mom, brother, dad, and I all attended at one point or other, and all but my dad participated in the choir) once performed in musical there, when he took a break from teaching to make a go at theater. My parents and I made a weekend trip to see it. The dish appeared at many family functions thereafter. That friend was also the pianist for my wedding. He was delightful. Another friend lost but who left behind bright memories. Tucked at the back is a recipe written on a piece of paper from a notepad, the page smudged with something from its preparation. 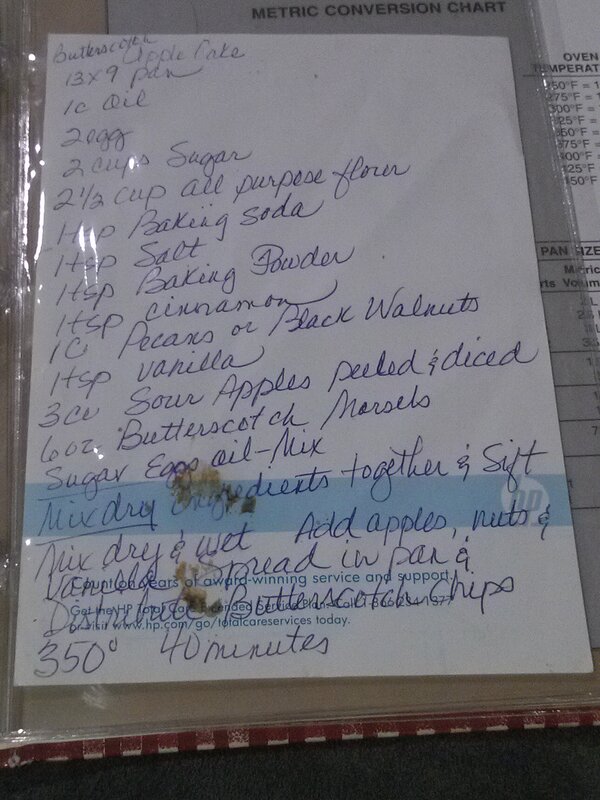 This one a butterscotch apple cake, originally made by one of my elementary school teachers. She had made little loaves for each of the students to take home, at Christmas break, I think. It was delicious. My mom wanted the recipe. I’ve actually thought of it sporadically, wishing I had the recipe but assuming it was lost forever. And then there’s this one, actually recorded by my dad. It’s incredibly simple. But it’s a longstanding holiday tradition. For as long as I can recall, every year at Christmas, we’d put this recipe to use. My brother and I would go to school loaded up with bags of fudge for our teachers. Our parents would take a bin to work and to family and friends and elder neighbors in our community. It’s a tradition that continues even now, with my dad, with me, with my brother and sister-in-law. What my brother and I received this year were simple, inexpensive gifts. And the richest and most incredible I’ve ever seen. 😀 I’m so glad you had a wonderful holiday!! This is so lovely! I’m so glad you have such beautiful memories preserved. What fun it will be to continue to use those recipes. Sounds like your dad found a great partner! Such wonderful and thoughtful presents! Sounds lovely! Those presents are those that are the greatest, brining both memories from before and making of new ones. Hope you get a great 2014.